This collaboration we did with the "Songs Children Sing" project brought 3 of our favorite things together - film, music, and human/nature connection. "Shells" from Film-Truth Productions on Vimeo. Our Gay Head Lighthouse Documentary & Historic exhibit kicks off on August 7th! 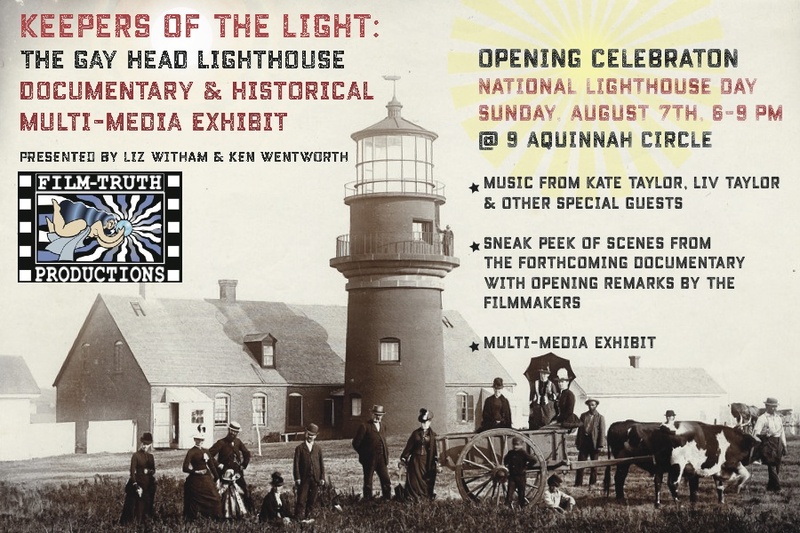 Filmmakers Liz Witham and Ken Wentworth of Film-Truth Productions are excited to announce the launch of the “Keepers of the Light - The Gay Head Lighthouse Documentary and Historical Exhibit” which will open to the public from 10am-4pm, Saturday, August 6th, 2016. Our episode "Ancestral Seeds" from our Sustainable Martha's Vineyard documentary series is now online! "Ancestral Seeds" from the "Sustainable Martha's Vineyard" documenary series from Film-Truth Productions on Vimeo. We are thrilled to announce the online release of our latest Sustainable Martha's Vineyard episodes. We kick the online series off with our episode, "Planting a Seed Library. Planting a Seed Library - Sustainable Martha's Vineyard documentary series from Film-Truth Productions on Vimeo. ANNOUNCING: Sustainable Vineyard Summer Screening! 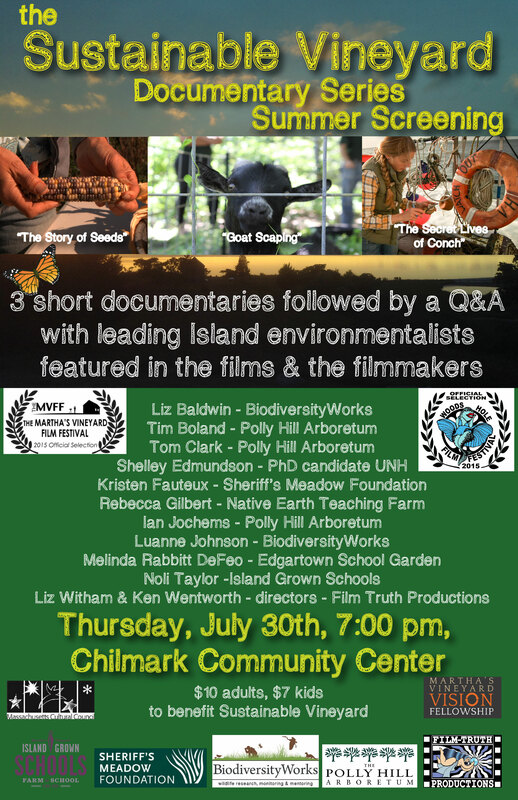 Come one, come all to the summer screening of episodes from Sustainable Vineyard! TEDx Martha's Vineyard videos live! This episode highlights the efforts of Island Grown Gleaning volunteers to help feed Islanders. The Sustainable Vineyard series seeks to benefit the island community by providing examples of people and organization working to promote a sustainable community. This series hopes to foster community identity by showing examples of islanders working towards self sufficiency and mutual cooperation. Sustainable Vineyard - Island Grown Gleaning - Helping hands serving our Island from Film-Truth Productions on Vimeo. This video is supported in part by a grant from the Martha's Vineyard Cultural Council, a local agency which is supported by the Massachusetts Cultural Council, a state agency. Come join us for a special screening, followed by a Q&A with Kate Taylor and the filmmakers, Liz Witham and Ken Wentworth and a meet & greet and DVD signing. 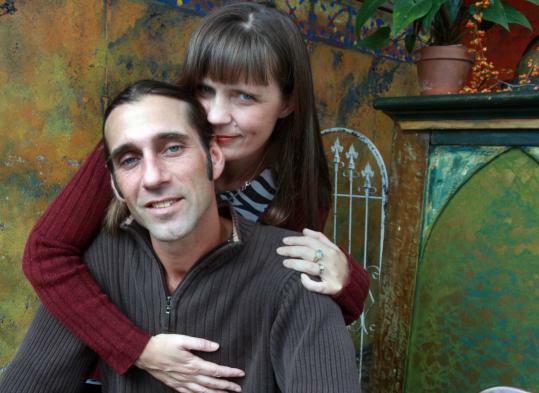 Film-Truth Founders Ken Wentworth & Liz Witham Featured in the Boston Globe! Film-Truth Productions founders Ken Wentworth and Liz Witham were featured recently in the "G Force" section of the Boston Globe. 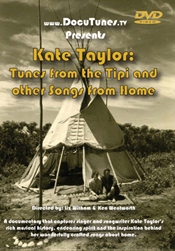 Announcing our new DVD, "Kate Taylor: Tunes from the Tipi and Other Songs from Home"
We are excited to announce the release of our feature length music documentary, "Kate Taylor: Tunes from the Tipi and Other Songs from Home"! After recording 3 albums and going out on nation-wide tours in the 70’s, Kate Taylor settled into a quieter home life on Martha’s Vineyard. After visiting a friend’s tipi, Kate set out to make a tipi of her own, where she and her husband Charlie Witham and their growing family lived for several summers. While she had a hiatus from touring and recording, she never stopped singing and she and Charlie continued to write songs. This documentary is an exploration of life on Martha’s Vineyard through the songs they wrote over a span of decades of living and raising a family there. In “Tunes from the Tipi and other Songs from Home”, Kate shares her stories of a simpler world viewed through the flaps of a tipi canvas.